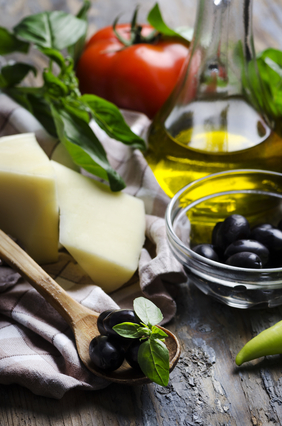 More and more health professionals are touting the Mediterranean diet. But what is it about that exotic part of the world that got it right when it comes to health eating? In one word, ingredients. Long ago people who inhabited countries that bordered the Mediterranean Sea tapped into eating local foods, not because it was trendy, but out of necessity. The availability of local food lead to a diet high in fresh fruits and vegetables, whole grains, fish and healthy fats. The diet was limited in red meat and chicken because it was harder to find and more expensive. It turns out that their food choices incorporated what researchers would discover as the basics of healthy eating. An analysis of more than 1.5 million healthy adults demonstrated that following a Mediterranean diet lowered the risk of death from heart disease, type 2 diabetes and cancer, as well as a reduced incidence of Parkinson’s and Alzheimer's. · Large quantity and a wide variety of vegetables, fruits and legumes. Proving that eating healthy doesn’t mean sacrificing taste, the Mediterranean diet is one diet the whole family can follow for good health. OPA!